When teenager Nick Gautier was saved from almost-certain death by a mysterious warrior, he had a feeling his life was set to change. Fighting the undead has taken the place of fighting with his teachers (well . . . almost) and Nick is learning to rely on his powers to protect the world from evil he could never before have imagined. Then, just when he thought things couldn't get any worse, he wakes up to find himself enslaved in a world of shapeshifters and demons out to claim his soul. He's being watched by the darkest of powers and if he doesn't learn how to raise the dead by the end of the week, he will become one of them . . . A must-read for both existing fans and those new to the supernatural world of the Dark-Hunters! 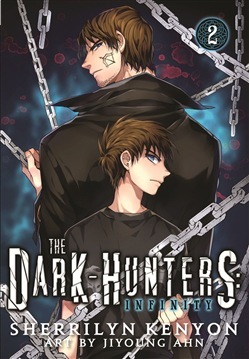 Acquista The Dark-Hunters: Infinity, Vol. 2 in Epub: dopo aver letto l’ebook The Dark-Hunters: Infinity, Vol. 2 di Sherrilyn Kenyon ti invitiamo a lasciarci una Recensione qui sotto: sarà utile agli utenti che non abbiano ancora letto questo libro e che vogliano avere delle opinioni altrui. L’opinione su di un libro è molto soggettiva e per questo leggere eventuali recensioni negative non ci dovrà frenare dall’acquisto, anzi dovrà spingerci ad acquistare il libro in fretta per poter dire la nostra ed eventualmente smentire quanto commentato da altri, contribuendo ad arricchire più possibile i commenti e dare sempre più spunti di confronto al pubblico online.